Thanks for visiting the PPS online shop! Find what you're looking for yourself or great gifts for your friends. You'll find unique merchandise with PPS art on t-shirts, sweatshirts, mugs and more. 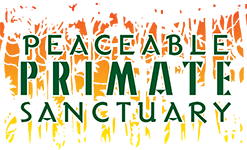 Peaceable Primate Sanctuary is the first Sanctuary in North America dedicated to the rescue and retirement of Baboons from research, entertainment and the pet trade.Your purchase helps us rescue and retire Baboons to a permanent home in Winimac , Indiana. See the PPS logo on your favorite items!